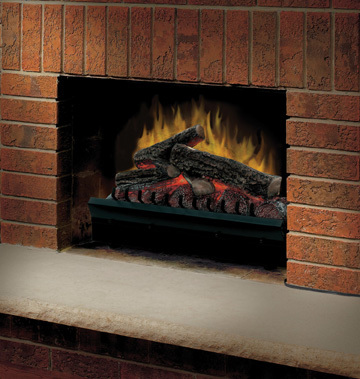 With no flame heat or emission Dimplex fireplaces inserts are the safe choice for your home. This 23" fireplace insert offers 1375 watts of heating power, patented flame technology and an easy to use remote control so you can turn the unit on or off with the touch of a button. Adjust heater settings to make the room comfortable any time of year with full heat, half heat, or flame only options. You can install this insert into an existing fireplace opening with ease and plug it into any standard household outlet of 120 volts. With its built-in, fan-forced heater this unit will distribute heat evenly and quietly throughout your room. It measures 10-4/5 by 23-1/5 by 19-4/5 inches and comes with a 1 year limited warranty. Does this have a remote control with it? Does this insert require a screen for safety? This does not require a safety screen. would half heat be sufficient to warm a 300 sq. ft. room? At full heat that unit is rated for a 400SF room. Per the manufacturer, the standard length is 6 feet. 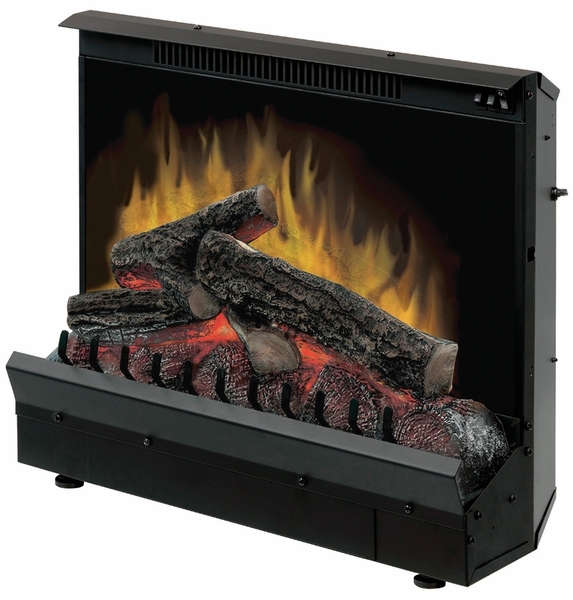 What is the length, width, and depth of this Dimplex DFI2309 standard 23 inch electric fireplace insert? This model is 23" wide, 10.75" deep, and 19.5" tall. Please review the sales brochure seen here. Addicted to my electric fireplace insert! I had to write a review. After using wood to burn in our real fireplace for many years, we switched to gas for another few years...expensive. Next decided to try the Dimplex DFI209 electric fireplace insert purchased at a home improvement store. We found our true love fireplace insert, which cost soooo much less to operate. I could enjoy my logs in July on a rainy day or on cool days for additional heat at a very small cost! This set lasted for over 12 years! Finally the flickering logs began not to work. I actually panicked as we could not do without our electric fireplace insert. I still had the papers from the original set so decided to try online. There it was and still at great cost with no shipping! I ordered on line and in no time we were back to having our beloved electric fireplace insert with those beautiful flames! We enjoyed them most every evening! Such a calming pleasure in today's busy lifestyle. Love this fireplace insert! Great Value. This insert enhances the coziness and homey feeling in my living room. I thoroughly enjoy it every night. The fireplace looks so real and by using the heating feature it warms our living room and makes it very cozy. I purchased this product for my wife and she loves it. She likes the entire ambience this insert gives the fireplace, she also loves the heating element. ProsThere is all pros with this product, the real looking flame, the red cinders, and the logs. I use this as a heater sometimes but often used as a fake wood fireplace. As an artist, the fake type does a lot of attraction element in my room. I enjoyed the days having a fire burning in this fireplace. During winter, the heater is perfect for cold mornings. For me the price is just enough. I can say that this one is one of the most interesting products I have bought within the past years. I bough this amazing mini-stove for my shop. My shop is about 14'x14' in size. This stove did a great job in insulating my shop, since the weather went down abusively this past few days.I love this since it is not heavy although it looks it is made of metal. The top and side coating stays cool even thoug the small vent in front shoots the warm air out for insulation. I love the glass door compartment housing the switches and you cannot see them if this glass door is closed. Even though the flame is fake, it adds up attraction to the shop. I have enjoyed my days with this little blessing and I am planning another one of these days. I decided to but this electric fireplace heater for my daughter who does not want any hassle in cutting wood or cleaning up the mess of a manual fireplace. The Dimplex fireplace heater was totally an answered prayer for us. It just took 5 minutes for me to install this. The remote control was so simple. Overall, it worked so fine. I would buy another if I need one.